Peaches are one of my favorite fruits. Whether in a can or fresh, they are good. Back in high school in a home economics class, I was given the BEST and simplest peach cobbler recipe. Ever since then I think I’ve had a fondness for them. This dessert originally called for fresh peaches but I didn’t have any at the time so I went with the canned version. This was a delicious, simple recipe that can quickly be made for the family or company. In a small bowl, add flour, sugars and butter. Using a pastry cutter or two forks, mix until it forms into crumbs. Add a pinch of cinnamon and nutmeg and mix. Add the peaches and mix together. Roll out crust and place one into the bottom of a 9in pie plate. 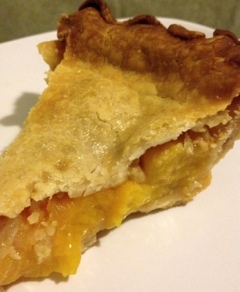 Place the peach mixture into the pie plate. Cover with the second pie crust and seal the two pie crusts together. Bake at 350 degrees for 45 minutes, or until crust is golden.